There are sections of scripture I feel as if I’ve heard a thousand times. Almost as if I know them inside and out. I know the value of hiding God’s word in my heart and I’m aware of the dangers of thinking I’ve heard that scripture already. Facing the reality that sometimes in hearing the recounting of scripture so much I start to treat it like just story and therein lose the power, the truth, the life-giving/life-guiding truth. Sometimes, when I open my steely heart, when I quiet my ever-rambling thoughts, when I submit to the working of the Spirit within me… I encounter God in the Word anew. And right then I knew. I knew I needed to see this section of scripture for the M.I.R.A.C.LE. that it is! 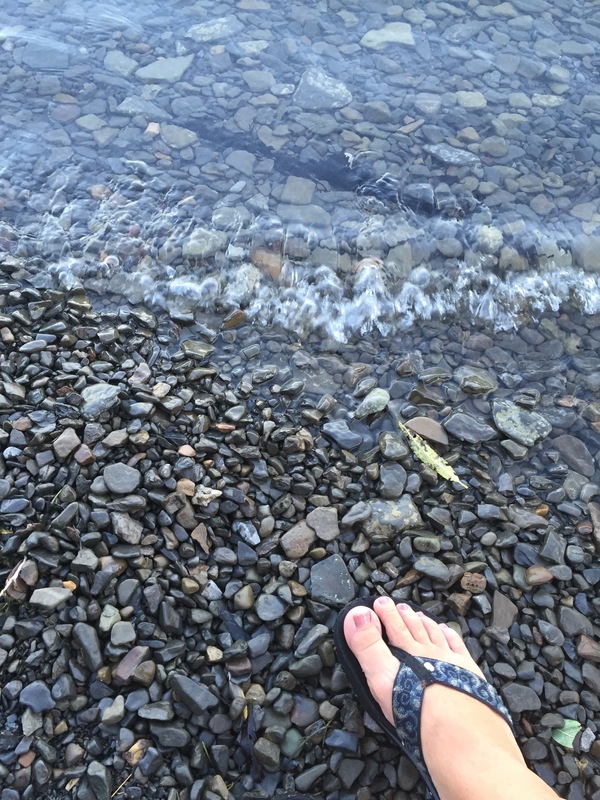 So in August I sat down by the lake, seeking for God to show me the awe of what scripture retells of Jesus, Peter and the disciples on their lake experience. Sitting there I realized I couldn’t imagine the shock, fear, bewilderment, awe, wonder… I’d feel to have seen Jesus walk across the lake that night. And I couldn’t fathom what it would be like to ASK Jesus to call me out upon the water. From the safety of the shore it was shocking enough. Not gonna lie, I was scared. Scared and Jesus wasn’t even asking me to take the step onto the water. But feeling so safe, because encountering the reality of the “craziness” of what Jesus had done gave me security in knowing God’s power. And that powerful God loves me. I can’t walk on water. Not sure I’d be ever brave enough to ask cause I’m pretty sure I’m already sinking into the waves, just about to drown… and I haven’t even left the land. God calls me out onto “waters” figurative which are just as terrifying as waters literal. And I’ve asked him to, oh so many times, just like Peter. I don’t know what I’m getting into but I do it: I ask God to call me. And, again just like Peter saw them for real, I see the wind and the waves metaphorical and I too am sinking. And when I call and even when I can’t… he catches me. I needed to remember that tonight. I needed to remember who God really is, how God cares for me, and who I am in him. What “water” are you facing? What “wind and waves” threaten your faith? How is God rescuing you?